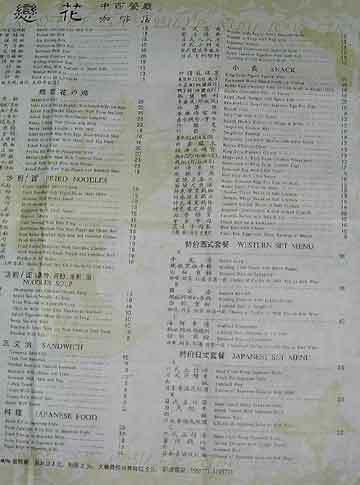 Here is a Chinese menu from the city of Doumen located in southern China near Hong Kong. I took some detailed pictures of a menu in one of the better Chinese/Western restaurants there named "Butterfly Love Flower Coffee Shop." Note the bottle of Soy Sauce at the left of the picture. It is made by Maggie, a food manufacturer from Switzerland. Southern Chinese don't use Soy Sauce in their food. You have to ask for it, but you might not get it. Only in Northern China and Japan is Soy Sauce added to food. 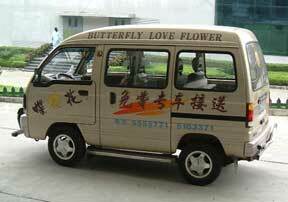 This is a picture of a most helpful van that takes us to and from the Butterfly Love Flower Restaurant. So have fun with the food in China. There can be some big surprises in any Chinese Menu, even if it's been modified for Western tastes.